There has probably been no more prolific set designer in the history of the Hong Kong theatre than Brian Tilbrook, who had an exhibition of his work in the City Hall when I lived and worked in Hong Kong. Models and stage sets may be an unusual subject for an exhibition, but in my experience Brian Tilbrook was an artist to whom the word ‘usual’ was anathema, as anyone who has worked with him will be only too ready to testify. His association with the Hong Kong Singers began in 1965, when at three weeks’ notice, he designed the sets for ‘Yeomen of the Guard’. ‘Yeomen’ is a one set opera but, glutton for work that he was, he ‘cobble-stoned’ the whole of the stage and, not content with that, did a magnificent front drop depicting an old print of the Tower of London which brought gasps of appreciation from the audiences which packed the City Hall that week. In riot-torn 1967, Brian designed the sets for the double bill of ‘Trial by Jury’ and ‘HMS Pinafore’, this show again being adorned with a splendid nautical front drop, and since then many shows presented by the Hong Kong Singers have had the benefit of his imaginative settings and flair for invention. ‘Orpheus in the Underworld’ in 1968 will never be forgotten by local audiences when a very high standard indeed was reached, due in no small part to Brian’s all-plastic settings. Scenery, props, floor and even the costumes were of plastic – 8000 sq ft of it altogether – and most of it made in Hong Kong. Following ‘Orpheus’ came ‘Ruddigore’ and several G&S afficionados were heard to declare that Tilbrook’s sets were better than D’Oyly Carte. In ‘La Belle Helene’ in 1969 Brian’s sets again scored heavily in another Offenbach skit on Greek mythology. In this show, his passion to hide the boards was finally realised when the whole of the stage was covered in a polyurethane treated floor. The 1969 presentation of the ‘Gondoliers’ was notable for its startling first act black and white motif, a real life fountain, and a bridge over the Grand Canal via which the whole chorus came on and off. Besides the main Island based groups the Tilbrook touch has been seen in Kowloon at Theatre 51 and at St George’s, where he was the Head of the Art Department, but the scene of his greatest triumphs has undoubtedly been the City Hall and the Shouson Theatre. 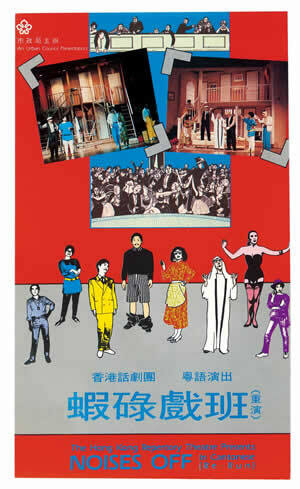 The exhibition in the City Hall foyer recalled nostalgic memories for many and was of great interest to all who had an enthusiasm for the living Hong Kong theatre.